Help Wanted – We Are Hiring! | Dance Supplies, Etc. home › Uncategorized › Help Wanted – We Are Hiring! Help Wanted – We Are Hiring! Dance Supplies, Etc. is hiring even more fantastic employees! 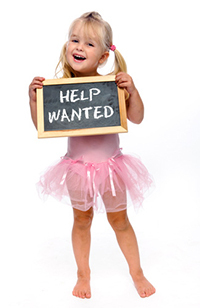 If you are passionate about dance, have a positive attitude and take pride in your work, then we’d love to meet you. We offer attractive wages, generous employee discounts, and a wonderful job environment working alongside other great people that are as passionate about dance as you are. If you are interested in this opportunity, please apply in person, or send an email to info@dancesuppliesetc.com. We look forward to hearing from you!